I met Sean last month at Shakespeare & Company, in Lenox, Massachusetts. Sean was working at the snack bar at the Tina Packer Playhouse, but I had seen him earlier in the week in an amazing performance as Trufaldin in an adaptation of Molière's Les Faux Pas. De revolutionibus orbium coelestium is the title of a book published in 1543 by the Renaissance astronomer Copernicus. The title, translated from the Latin, is On the Revolutions of the Heavenly Spheres. "I was looking at the root of the word revolt or revolution and it comes from Copernicus ... so I was wanting something that had ... the idea of revolt and revolution ... I became curious as to where the word came from ... [and] I started reading about his theory." As regular readers of this site can tell you, I love textual tattoos, and the idea of inscribing the title of a book almost 500 years old is fascinating, because it's not just about the title, but about the ideas espoused therein. This entry is © 2008, 2011, 2013 Tattoosday. I ran into Tracy last month in a drugstore in Penn Station. 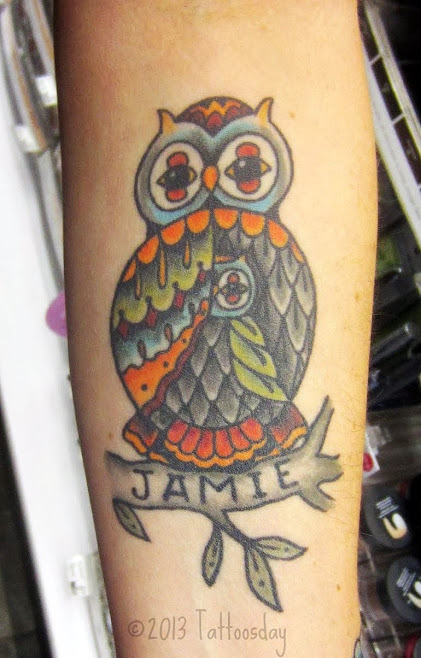 The name "Jamie" refers to her son. This is a mother owl with a protective wing over a baby owl, whose head can be seen resting in the middle of the mama owl's chest. This was inked by the talented John Reardon at Greenpoint Tattoo Company in Brooklyn. Reardon's work has appeared countless times on Tattoosday, and it's always an honor to feature his work on the site. Readers may remember this narwhal by him which we featured back in June. Thanks to Tracy for sharing this lovely tattoo with us here on Tattoosday!